Creating World Class Dental Hygiene Service In Your Dental Practice. Part IV. Today it’s time to look at the examination process for the dental hygiene patient who visits your dental office for their regular hygiene appointment. This article is Part IV of a weekly series of articles that explains the hygiene process that I used IN DETAIL to transform the hygiene visit for the regular loyal dental patient away from being considered to be “just another cleaning”. This regularly scheduled visit truly can be an ULTIMATE PATIENT EXPERIENCE each and every time. Three weeks ago I discussed the important role that a dental hygienist plays in the creation of an EXPERIENCE for their patient so that the hygiene visit for the regular loyal dental patient is not simply “only a clean”. In that article we discussed the important role that the dental hygienist plays at the beginning of every patient’s hygiene appointment. We looked at the important role of Emily the hygienist in creating a perfect platform at the start of Mrs Smith’s hygiene appointment, truly “setting the stage” for the remainder of the visit to be a World Class Experience. Then two weeks ago I discussed the level of trust established between the hygienist and the patient already during the first forty minutes of the hygiene appointment, and how with that, the time taken by the dentist to do the examination and explain treatment inside the hygiene room was significantly less than when the hygienist took no part in any uncovering and discovery of areas of concern prior to the arrival of the dentist. 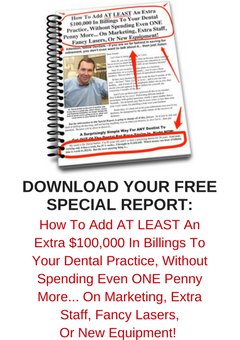 Last week I wrote about the best way for the dentist to be alerted about the hygiene exam, and how to turn that notification into a systematic, structured and discrete internal advertisement for your dental practice and your world class customer service systems. The dentist arrives into the hygiene room. The purpose of the dentist’s visit to the hygiene room is to examine the patient and review the findings of the hygienist, as well as to discuss all areas of concern that the patient may have raised. When the dentist arrives in the room, it is always at the designated time that the practice has predetermined, and it is always AFTER the time that the hygienist has gone to notify the dentist that he is now required. The dentist DOES NOT EVER arrive unannounced. The visit of the patient for their regular hygiene appointment is structured to provide MAXIMUM experience for the patient. The appointment chronology is organised so that the hygiene patient never feels as though they are an appendage to the dentist’s day. The regular hygiene patient must always be made to feel as though they are the ONLY appointment that matters on that day. The dentist enters the room and is greeted by the hygienist and his arrival is announced to the patient. The dentist thanks the hygienist, and greets the patient. The hygienist then updates the dentist about any social topic that she has been discussing with the patient. This could include any recent travel, any family events, or any work related stories that they have been discussing. The dentist then joins into that social conversation with the patient, as the hygienist [aurally] removes herself from that conversation. At the appropriate time, the dentist decides that it is time to perform the patient’s dental examination. and then goes into detail about her findings and observations. During this process of discussing this first area of concern, the hygienist will also present to the dentist any relevant images and radiographs that she has taken. The hygienist also lets the dentist know of any treatment options that she has discussed with the patient. These initial area[s] that the hygienist raises with the dentist are major areas of concern discovered by the hygienist, along with any areas that the patient has raised already with the hygienist. It is important that the patient feels that these areas of concern are being conveyed to the dentist BEFORE the dentist begins the regular dental examination process, as opposed to being raised DURING the examination itself. By doing this, the dentist and the hygienist HEIGHTEN the urgency and relevance of these primary areas. Once these areas have all been discussed and treatment planned, the dentist and the hygienist then continue with the examination process. In my office, this process involved the hygienist describing EACH individual tooth and its condition, one at a time, beginning with the Upper Right Third Molar and finishing with the Lower Right Third Molar. Each tooth is mentioned as to its presence, its restorative status, and whether there is any pathology [or perceived pathology] present that the dentist needs to review. By doing the examination in this way the importance of the hygienist in the process is raised and elevated in the patient’s eyes. When done correctly, this examination process can be an efficient time saver for the dentist because his examination then becomes a matter of “review” as opposed to “discovery”. The dentist’s role is to review all of the findings of the hygienist and to finalise the correct treatment path for the patient. Following the completion of the oral examination by the dentist, the hygienist then clarifies with the dentist which area exactly the dentist is going to start treating first, and the time frame is clarified as to when exactly as well. The dentist explains to the patient what is being done next, and when, and whether he wants the patient to be seen sooner, should anything become available. The dentist also informs the patient exactly what will happen if this first treatment is delayed and not carried out in the recommended time frame. Next week I’ll be discussing the farewelling of the patient by the dentist, and the subsequent completion of the hygiene appointment process by the hygienist and the front of office team members. Remember, that during all of this process, the patient is always feeling care and attention from the dental hygienist, the dentist, and the whole office team. The regular hygiene patient must always be made to feel that they are the MOST important client of the day.